数は少ないが他に語根名詞 (子音で終わる)、親族名詞(/er/で終わる)、 /z/型の中性名詞 (ドイツ語ではこの型が一般化した)、 現在分詞など /nd/で終わる名詞がある. Antonsen, E. H., On Defining Stages in Prehistoric Germanic, Language 41 (1965), 19ff. Bennett, William H. (1980). "An Introduction to the Gothic Language". New York: Modern Language Association of America. Campbell, A. (1959). "Old English Grammar". London: Oxford University Press. Fausto Cercignani, Indo-European ē in Germanic, Zeitschrift für vergleichende Sprachforschung, 86/1 (1972), 104-110. Cercignani, Fausto, Indo-European eu in Germanic, Indogermanische Forschungen, 78 (1973), 106-112. Cercignani, Fausto, Proto-Germanic */i/ and */e/ Revisited, Journal of English and Germanic Philology, 78/1 (1979), 72-82. Cercignani, Fausto, Early Umlaut Phenomena in the Germanic Languages, Language, 56/1 (1980), 126-136. 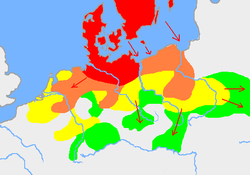 Lehmann, W. P., A Definition of Proto-Germanic, Language 37 (1961), 67ff.